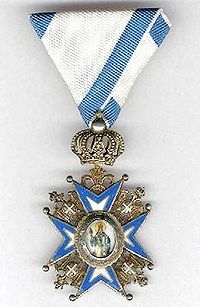 King Milan I of Serbia instituted this noble decoration named The Order of St. Sava in 1883. This honor was originally conceived to be bestowed upon civilians who had achieved excellence in the field of the arts and sciences. 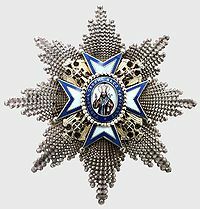 With the onset of World War One in 1914, the Order of St. Sava was also designated to honor military personnel for meritorious conduct. "I, Manuel, the Ecumenical Patriarch and the Archbishop of the City of Consrantinople, New Rome, in the name of our Lord Jesus Christ, have consecrated Sava, Archbishop of all the Serbian lands, and have given him in God's name the authority to consecrate bishops, priests, and deacons within his country; to bind and loose sins of men, and to teach all and to baptize in the name of the Father, and the Son, and the Holy Spirit. 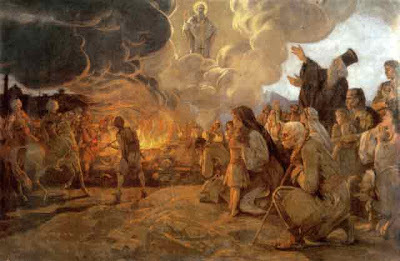 Therefore, all you Orthodox Christians, obey him as you have obeyed me." 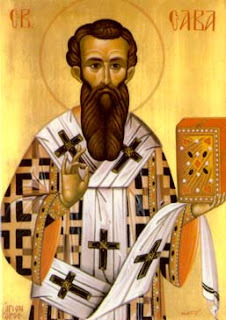 Aleksandra's Note: St. Sava of Serbia is one of the greatest Christian saints in the history of mankind. His story is not only a compelling human story, but his spirit and essence has inspired, guided and enlightened people for centuries after his death. He was such a magnificent historical figure that this inspiration and enlightenment continues into the modern day and age, when St. Sava's wisdom is needed so desperately to guide us through navigating the turbulence of our mortal world. Sava was born the third son of the legendary founder of the magnificent medieval Serbian state, Stefan Nemanja. Sava's given name was Prince Rastko Nemanjic. He was born in 1175. I would like to direct you to two sites that will provide a wonderful insight into why Sava of Serbia is such a compelling historical figure and among the greatest of Christian Saints. You will learn about the journey he made through his life and why he is held so dear in so many hearts today. So many Serbian heroes that came after Sava's time turned to his teachings for guidance and even in wartime, perhaps especially in wartime, never failed to honor his legacy.﻿ This reverence continues everywhere that Christian Serbians live, but it is in Belgrade, Serbia where the stunningly beautiful Cathedral of St. Sava stands on the Vracar plateau, where Sava's remains were burned by the Moslem Turks in 1594, that one is reminded most of what he contributed to the Christian world. "Saint Sava is one of the most revered Saints of the Serbian Orthodox Church. Understandably so, since he established the SOC in 1219. Since then, this institution has survived enormous hardships by Ottoman Turks, German Nazis, Croatian Nazis, Bulgarians, Hungarians, Albanians, Communists... you name it... and has remained the cornerstone pillar of Serbian faith, identity and being. 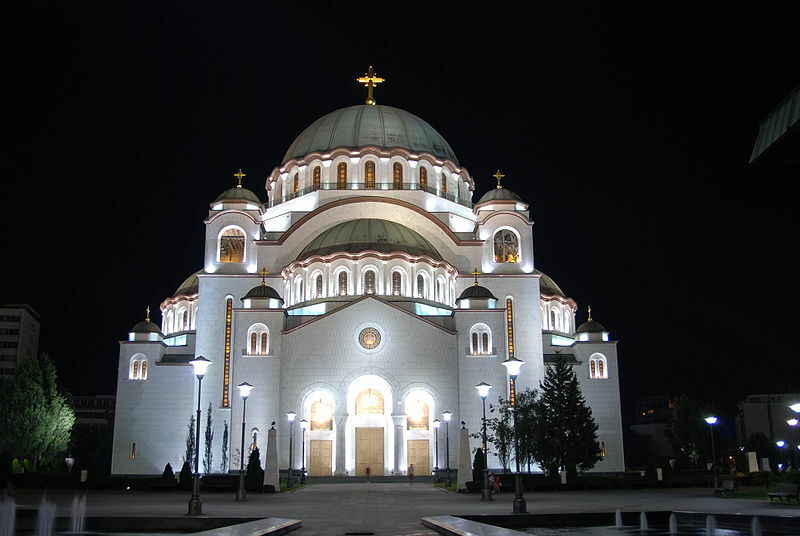 January 27, Saint Sava Day is observed as Spirituality Day (Dan duhovnosti), but is marked as a working holiday, except for celebrations in schools. 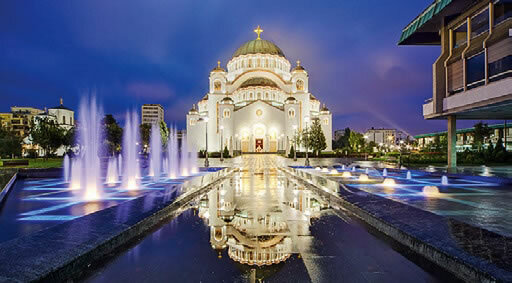 In the evening, the Saint Sava academy is organized at the Sava Center in Belgrade. Saint Sava is my favorite Serbian Saint although he is not my Patron Saint." January 27th by the Gregorian calendar is St. Sava's "Feast Day", the day he is officially celebrated, and in honor of him I'm sharing three videos that reflect the spirit of Sava. In the world such as it is today we need to incorporate that spirit into our private and public lives more than ever if we are to survive with our souls intact. The following video was posted on YouTube by "jelmarsrbija"
Posted on YouTube by "mrkosovac"
Posted on YouTube by "ivanazigondsrp"
Molite se, braco draga, ovo malo sto nas ima. Molite se Svetom Savi, on ce Bogu i svecima. Chorus: Pec, Pristina, Istok, Glina.